Toddlers get more excited the very moment they began to crawl. It is the joy of parents to see that happen and while they are happy, the toddlers as well get excited as you get to see that through the expression on their face. Parents can enhance their kid’s development with the use of foam climbing blocks. 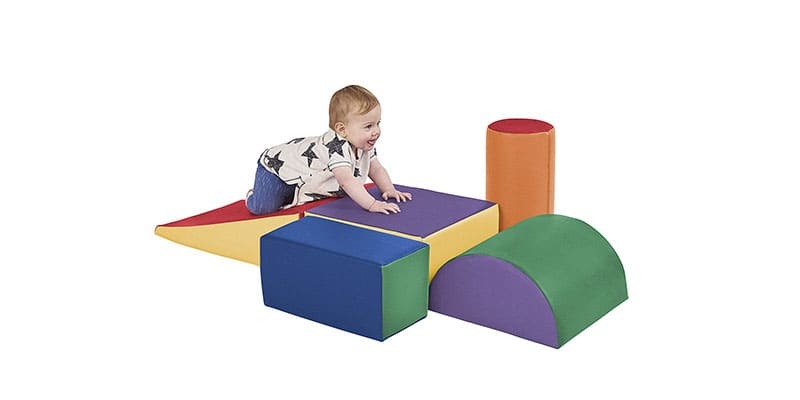 There are different types of foam climbing blocks, and one of the importance is that it is safe to use but not in the absence of the parents. 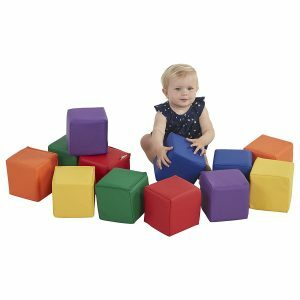 Let’s check out some of the Best foam climbing blocks for toddlers in the market you should consider for your toddlers. 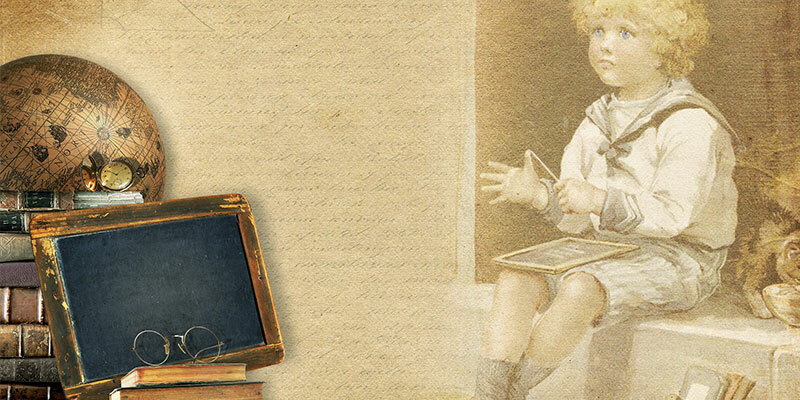 One of the best ways to keep your kids engaged is through the use of ECR4Kids SoftZone. The wonderful foam forms a play set for toddlers and infants to have fun for as long as they have access to the foam block. The playset comes with different styles and color which makes it attractive and appealing for kids to use. 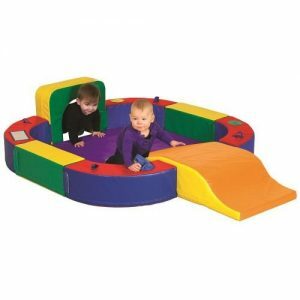 With it, infants and toddlers can crawl, climb and slide on it but it requires the supervision of an adult. 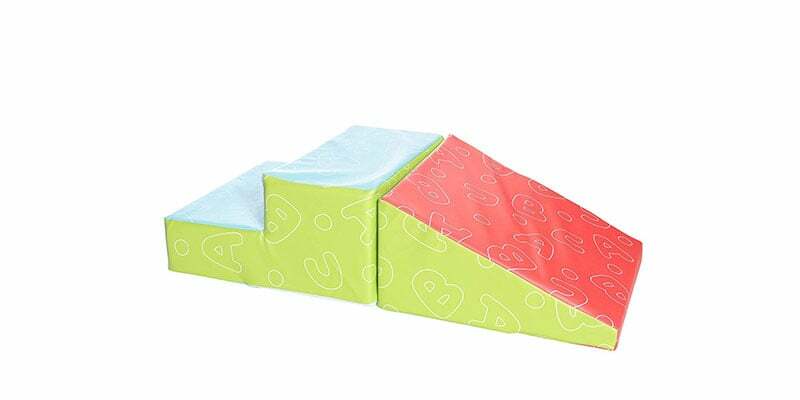 The foam block keeps your kids safe and secured as it has a non-slip bottom to keep the blocks in place. The foam block offers more than fun and excitement to toddlers. 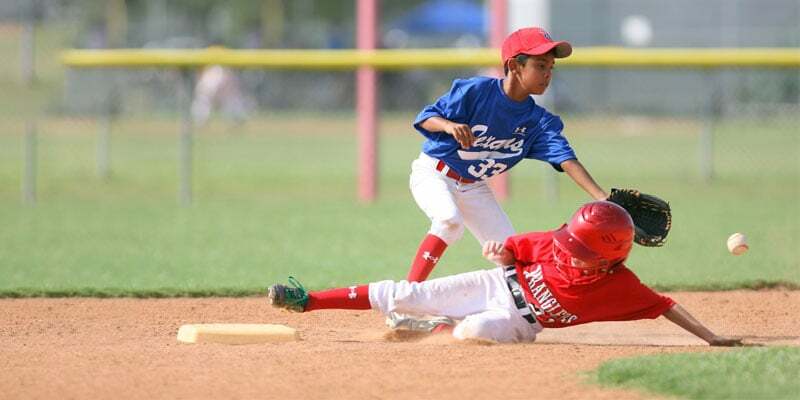 It helps them to develop motor skills and improve their coordination. Also, it requires less maintenance, it is easy to clean, it is non-toxic and safe, ideal for kids within nine months to 3 years and adult supervision is required. The Constructive Playthings as it’s been called is a dynamic play set for infants and toddlers which is designed for fun and excitement. The play set comes with all kind of shapes and color. It can be used to construct all kind of design to make your toddlers get the un they crave for. The climbing foam is a perfect indoor fun kit to get your toddlers and babies engaged. 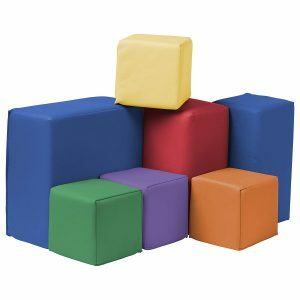 The set comes with just five pieces of the block, and they are lightweight which makes it for toddlers to move around. It is safe to use as it has a non-slip bottom and it is non-toxic. The play set is made from easy to clean Vinyl which is of different colors. The package includes two building blocks, a large half cylinder, and a cylinder. It is ideal for infants and toddlers from 12 months above. Apart from the excitement and fun kids derive from the use of the set, the playset also helps to expand the minds and enhance the growth of babies. The surface of the foam block is safe, and it is very easy to clean on the off chance it gets stained. The ECR4Kids SoftZone is a simple design foam climber for kids to have fun and excitement to the fullest. The two design climber is perfect for climbing, crawling and sliding for toddlers and infants that are still learning how to crawl and climb. The climber is safe to use as it comes with dense foam to help keep kids cozy and safe whenever they play with the climber. Not only is the climber designed for fun and excitement, but it also plays an excellent role in the gross motor development of babies. The design and construction of the climber mean you have less to do with the maintenance. The foam is soft, colorful and the surface is easier to clean. The foam climber is non-toxic and safe. It is advisable that kids don’t use with their shoes on and parent’s supervision is required. The Milliard Soft Foam is one of the best climbers you can consider for your toddler ad infants. Your babies have one of the best to play toy to climb, crawl and slide. The Milliard Soft Foam is the perfect toy or infants to have indoor without any fear of getting injured. It is fun to use for infants and toddlers, and it also helps in the improvement of gross motor skills and also increases their physical development. The foam climber has a Vinyl cover that is durable and resistant to stain which makes it easier to clean and maintain. The foam is soft, and it comes in different shape and colors that your babies will love to spend more time with. It requires the supervision of adults whenever babies want to use the climber. If you are in for an adult kid climbing block, you might have to look elsewhere. 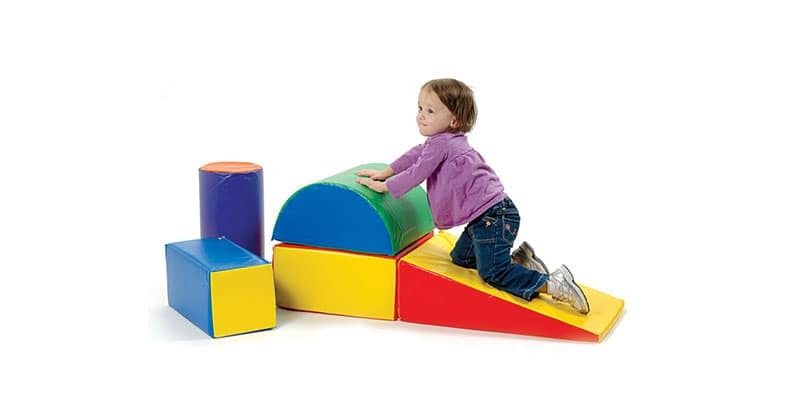 This fantastic climbing foam is ideal for toddlers as it comes with seven pieces of foam of different sizes and color. 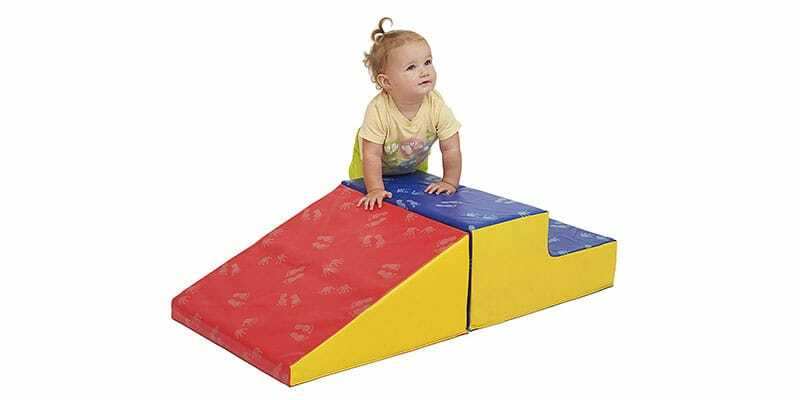 The climbing foam has alluring designs with attractive colors which have proven to help toddlers become creative with gross motor skills as they spent quality time playing with the climbing foam. Safety and comfort of your toddlers is very important and considering the materials, and the foams are made of, your kids will remain safe as they stack and play. The package on arrival includes seven blocks in 3 different sizes such as one large rectangle, two medium rectangles, and four small squares. The materials in use are non-toxic which makes it a perfect toy for kids to have fun and excitement. With the durable soft cover, the climbing foam is very easy to clean and wipe off dirt using a mild soap and water solution. You want to see you kids show off their creative skills, and you might need to get this ECR4Kids Softzone Toddler Play Soft Blocks. The toy comes in 12 pieces blocks that kids can choose to play with in different ways. The dense foam blocks are covered with soft, durable covers and inside stitching. The colors are unique which is enough to get younger one’s attention. The compact foam block is ideal for toddlers and children from age nine months and above to build and play without any risk factor. The foams are sturdy and very safe to use for toddlers. You will find it in places such as preschools, daycares, and some other homes. It is built to last long, so your babies have a fantastic toy set to play with for more extended period. Enjoy time with your kids playing around with the foam to make them happy while you stay with them. The foam doesn’t retain stain as the cover can easily be cleaned, and it is odorless as well. Do you desire for something different for your kids from the style and types of toy foams above, this ECR4Kids SoftZone Discovery Circle might be of interest to you. The toy foam, when placed in position, gives a circle shape. The Circle foam offers more than fun and excitement to kids. It helps to develop their sensory skills and improve their development in all aspects. 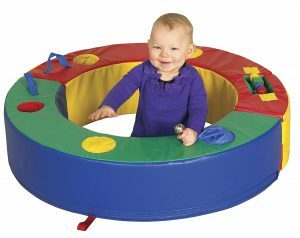 Infants and toddlers can spend luxury of time with the soft-sided of the circle foam. The Circle foam has soft cover all around it as it comes in a different color to get the attention of kids. The cover is more comfortable to clean using any cloth and mild soapy water to get rid of stains. This is a dynamic toy you have here for kids. Your infant and toddlers will ever appreciate your kind gesture to get them a toy like ECR4Kids SoftZone. The toy comes with eight foams of different styles. When installed, it turns out to be a perfect place for kids to play and have fun. It is safe and fun at the same time for kids to use. It is not just designed for fun and excitement, and it as well plays a significant role in the development of kids sensory and motor skills. The foams come with a covered cloth that is soft and easy to clean. As kids move around the toy, they are safe from having contact with the floor as it comes with a mat to keep their leg safe for infants and toddlers that still crawls. Are you still torn in decision making to get your kids active with toys that are safe? The foam climbing blocks for toddlers is the best for you to consider. It is one of the ideal play toys you can get your kids to get them engaged with lots of fun and excitement. I am Sage Bishop, Father of two kids. Working as Cisco Engineer. Love to spend time with Family. And write Blog about parenting and kids fun stuff.